Renewable ocean energy, which includes tides, waves, tidal stream, ocean currents, thermal gradients, and salinity gradients, represents a significant resource for clean renewable electricity generation. To date, only the tidal barrage has reached commercial maturity and is being used in the UK. Thermal and salinity gradient technologies have not reached the pre-commercial maturity level. Ocean thermal energy conversion (OTEC) technologies are still very expensive and the lack of pilot sites with installed power systems harnessing this type of energy pulled away support from a number of investors worldwide. On the other hand, wave energy conversion (WEC) and tidal in-stream energy conversion (TISEC) systems have reached full-scale and are in the pre-commercial scales of maturity. When compared, tidal energy resource is considered more predictable and consistent than wave energy resource. Tidal in-stream energy (TISE) is a form of energy that arises when streams of water flow between landmasses as a result of tidal height differences. Sites where available tidal in-stream energy occurs in large quantities are those sites where the flow is constricted, resulting in higher current stream velocities. These properties are exhibited by channels and straits. In the Philippines, the Department of Energy (DOE) has identified at least eight of these sites. In 2004, Blue Energy, a tidal stream energy company from Canada assessed the potential of San Bernardino Strait to be 2.2 GW using their TISEC device array (274 Ocean Class Davis turbines, rated at 7 to 14 MW each). In October 2013, the Department of Energy awarded to H&WB four service contracts in different areas– three along San Bernardino Strait and one in Sta. Ana, Cagayan Valley for Tidal-in-Stream Energy Conversion. 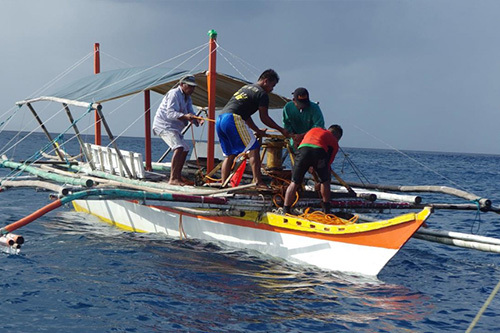 A resource assessment study was launched by H&WB Corporation for three sites in San Bernardino Strait where H&WB holds Service Contracts with the Philippine Government. OceanPixel covered the resource assessment done in these areas: Matnog, Capul, and Dalupiri.